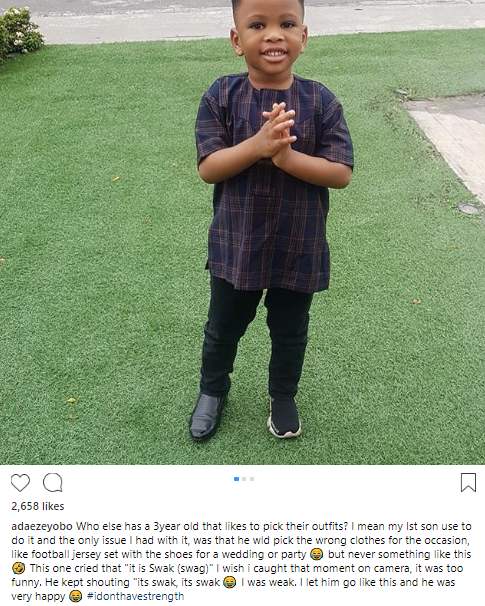 Former Most Beautiful Girl in Nigeria, Adaeze Yobo, has shared photos of her second son’s outfit and told the story behind the choice of clothing. The mother-of-three said he chose the combination himself and refused to be swayed when he was told he shouldn’t step out dressed like that. 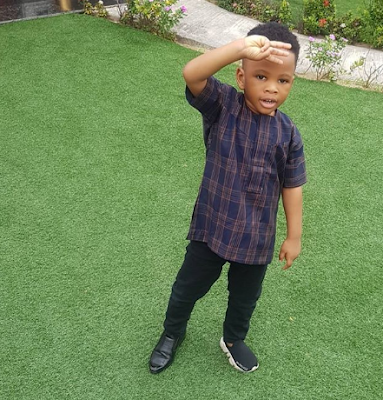 ”Who else has a 3year old that likes to pick their outfits? I mean my Ist son use to do it and the only issue I had with it, was that he wld pick the wrong clothes for the occasion, like football jersey set with the shoes for a wedding or party but never something like this This one cried that “it is Swak (swag)” I wish i caught that moment on camera, it was too funny. He kept shouting “its swak, its swak I was weak.